After the time has passed come back and click the exclamation mark above your sims head to find one of the make up collectibles. 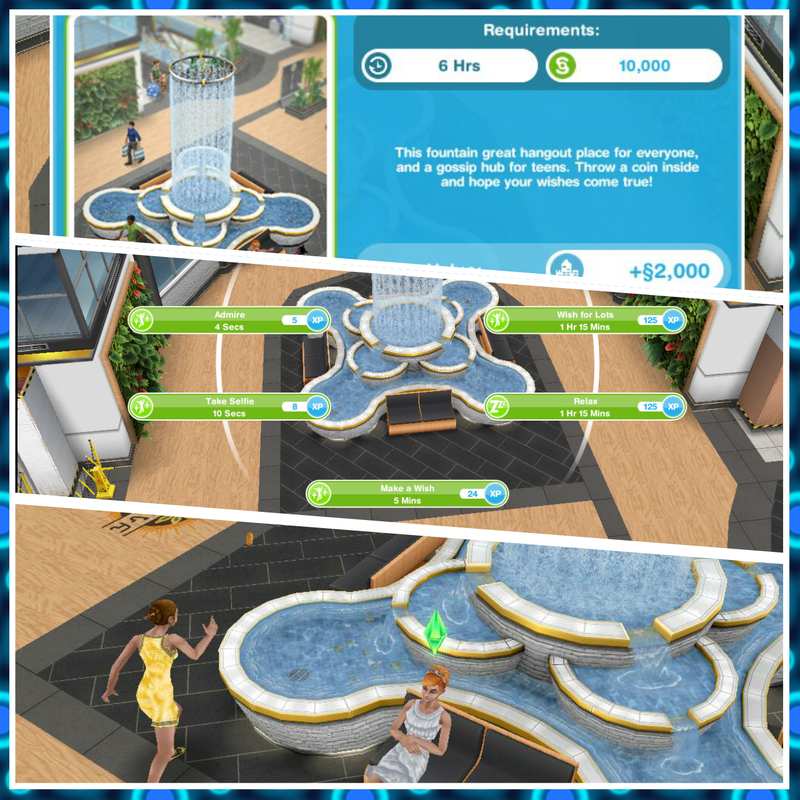 Every time your sims complete this hobby their hobby skill level up percentage will increase, once you reach 100% you will level up, there are 6 levels. You need to reach level 6 to be able to unlock all of the make up collectibles, once unlocked you will be able to find them. 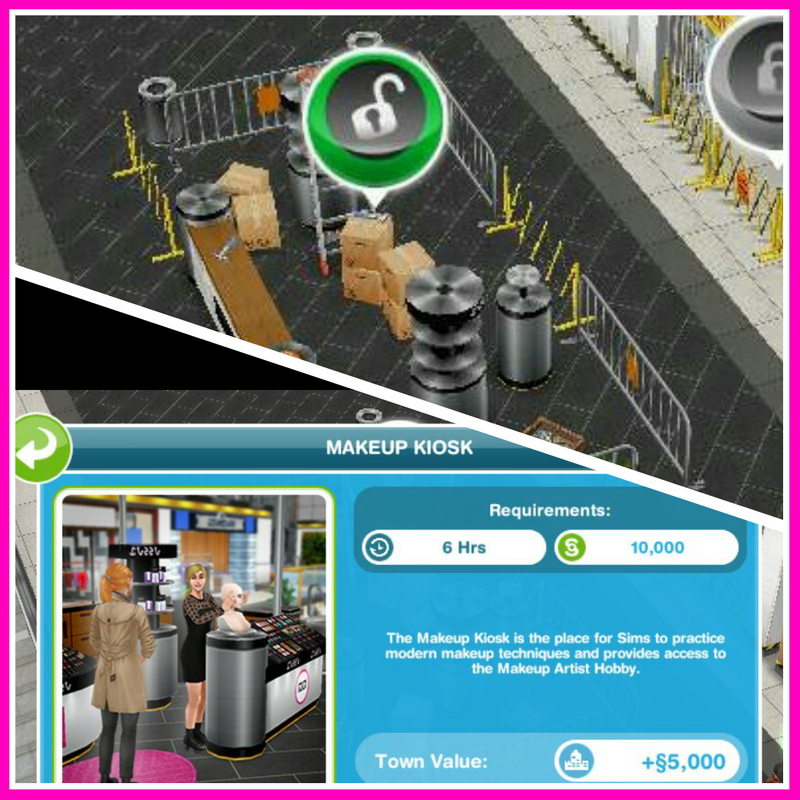 Model Maker Lash Out and Lip Stick Up are now unlocked in the hobby collection. Thank you this will help! you can’t until you can build the makeup kiosk at the mall. For the make up artist hobby it shows you can do it in a neighbors town, but it requires two sims to do it so how is it possible to do it there when you can only have one Sim in a neighbors town at a time? Could I add you as a Neighbor ???? 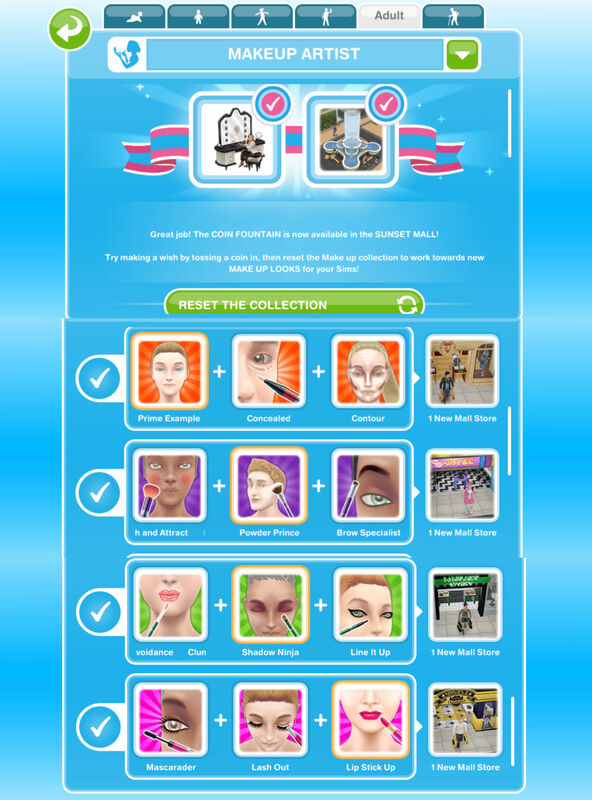 (1) Quickly whistle all 5 fashion hunting sims to the mall. I say 5 because I am using the max number of sims for this hobby. (2) Go to the 2nd floor of the mall and VERY quickly select fashion hunting options for all 5 sims. I seem to get better results if I start with the four square bins near the photo booth. (3) IMMEDIATELY exit the mall by going to map view, the party boat or a sim’s house. (4) Wait a few seconds and return to the mall. I seem to get better results if I reenter the mall from map view, rather than getting back to the mall by clicking on a fashion-hunting sim in the sim tracker. Here is where the glitch happens: When I return to the mall, I consistently find that anywhere from 1-4 of my 5 fashion-hunting sims are now DONE fashion hunting and have a “!” even though they have been fashion hunting for less than a minute. (5) Collect collectibles by clicking the “!”s and cancel any sims who are still running around hunting for fashion. (6) Go to a house or a community lot like the park and whistle all 5 sims out of the mall. (7) Repeat, starting with step (1). I haven’t been able to determine exactly why this is happening or how to make it work for 5/5 sims every time. I have noticed the glitch seems less likely to occur if the sim is already on the 2nd floor when I choose fashion hunting for them and/or when I exit the mall, which is why I get them all out of the mall before starting the process and then whistle them back when I’m ready to start a new round. I’ve tried just sending them back to the ground floor before starting over with step (1) but find that as I am trying to get one sim downstairs, others are already taking the escalators back up (presumably to sit on random benches as sims like to do). I just would like to share a suggestion. Make up and tattoos should be separate categories, so that they are able to wear make up and tattoos simultaneously! Thank you for this space, I really like your site, too. You would have to contact EA to suggest that to them, I only play the game, I don’t work for them but I think that is a good idea! This didn’t happen to me but when I started them off a few times one of them was just standing there pulling poses and not doing the hobby so I cancelled and made sure that they looked like they were having a conversation before I closed the game, I don’t know if this is the problem you are having but it might be. If this doesn’t fix this issue you may need to contact EA to see if they can fix it for you, sorry! Thanks for this advice, mine has been glitchy as hell and I’ve only managed to get one complete interaction in two days. Bummer that this is a timed quest, but I got them talking before I switched to another sim house so hopefully that will do it. I’m having the same problem and have used 16 of my lP’s so far. Did you have any luck contacting EA’abiut this problem as I’m at a loss as what to do? I’ve had this happen a few times as well. What I’ve done that seems to have fixed it is to wait until I see that the progress timer on both sims is moving before I leave the mall. Can we do this hobby in a neighbor’s town? 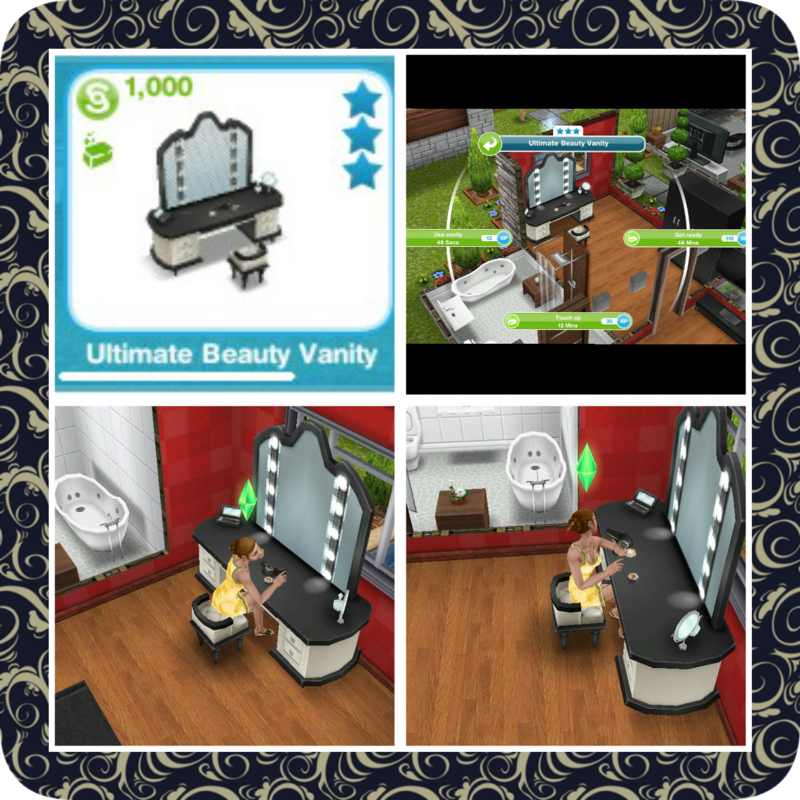 what can i do with the beauty vanity. is this price worth?? Personally I think it is worth it. I don’t see the artist hobby and my shopping mall is completely finish and I have even done the fashion hobby! Help Anybody know why I can’t do this hobby yet??! After waiting 4 hours four times, each time I get Conceal. Frustrating! Why am I only getting Conceal? Any ideas? Do both sims level up in the hobby or is it just the one doing the make up tutorial? Like how in the salsa dancing one, both sims earned % toward the next level even though one was responsible for initiating it? How many sims can pair up to do this? Gosh I don’t like these ones where you have to complete the collection multiple times in order to collect all the outfits / makeup. Particularly this one where you can only do it one at a time! Thanks for your blog though. Does making a wish at the coin fountain do anything? I’ve tried a few times but so far nothing. I continue to get the same thing every 4 hours. Oops it posted before I was done. As I was saying I have just kept going since I need it to get the shops available but I’m pretty sure I won’t get the mirror. Heyy! Can you tell me what is the use of the beauty vanity? it shows you in the post. I have browsed for makeup three times and I keep getting concealed. What am I doing wrong? you aren’t doing anything wrong, some you just find more than others unfortunately! LPs! To get from level 5 – 6 takes 5 days and you only have 7 to do the hobby (or be left with an unfinished skydiving area in the mall). I keep checking here to see if you’ve done it … Or have any tips! No, I am waiting for the timed campgrounds hobby to start first- really don’t want to be doing two timed hobbies at once! The fashion hunter hobby is awful! I really wanted the indoor skydiving so with only 2 days left I started to use my lifestyle points, I used over 550 and still didn’t complete it in time, I used 200 on the last item and I still don’t have it now! It’s so ridiculous all of these timed hobbies and I am more than a little annoyed that I now have no life points and no skydiving! Hi … your blog is great! I have a question about the quest after the makeup one where you can get the sky diviving thing … when the time expires can you still get it?? If you don’t complete the hobby on time, can you still buy the vanity? 1) Does redoing the collection of the make up hobby expand the make- up / hair options? 2) Is the mall salon in addition / expansion to the town’s salon? I haven’t built the town’s salon, yet. I wanted to give my sims more options but rather build economically. 3) Could you suggest the popular path of town building: the salon or car dealer? Those are my last available builds. Thanks for your time on your site. CHEERS! I just tried, and failed to get the vanity. So annoyed. I swear it said I still had an hour and a bit left, and then just as I was working on the cooking hobby to get LP’s to fast-track the makeup artist hobby, I got a message saying the timer was up and the vanity was gone. GRRR!!! I hope this comes back as a buyable in the online shop, like the Latin Villa I missed out on the first time (I didn’t even notice the salsa hobby to unlock the house). If it’s only $1 like the Latin Villa, I’d definitely buy it. I ended up buying a few things with that Black Friday sale they had…the Latin Villa, the fish tank and the pool cleaner. Hopefully they do the same thing for Boxing Day. This is only the 2nd time I missed out on an item. Stupid concealer. I even managed to finish that magic mop quest in time, and that baby bouncer thing too. Grrr. Really wanted this one. Where can we find new hair style for adults? Salon? Or everytime we reach level ad they’ll be automatically added to our wardrobe? you should find them in the wardrobe. I only started Makeup hobby yesterday and today it is telling me my time is up and I have missed out on the vanity! I thought I had 7 days. Really annoyed because I used quite a few LP’s to Level up quickly. Beware. If this is a glitch, hopefully EA fix it in the next update. And thanks, I hope you had a good Easter! Hi! I’m not sure if this is a glitch or if they have somehow changed the prize for the end of this quest? But I started the quest 4 days ago (still have three days left to complete) and from about two days ago I realised in the “featured” tab section of the home store the vanity was for sale and unlocked for me to buy. I have purchased about 10 of them now in case I don’t complete the task to unlock it at the end and/or it is a glitch? So what would happen to the vanity’s I have placed in my houses? Would they disappear? No, you keep the ones you buy. Very helpful site. Do you have photos of the unlocked makeup looks? Or of the new hair styles from the mall salon? I also bought 4 pieces of vanity when it was featured on sale for a limited time. I guess I will not be disappoint that much if I missed the make-up artist hobby limited prize because the vanity looks the same… I’ve just realize that I really buy sale items that I can afford even when I don’t use it yet… Just for future use… like the music festival dress last time. Thank you @weightlessmagic for your helpful blog. I haven’t completed the pretty little planter quest yet, but the makeup and bargain quests got activated. You will need to contact EA about this issue so they can fix it for you as I am unable to fix technical issues. You will need to contact EA so they can fix this issue for you as I am unable to fix technical issues unfortunately. Once you have unlocked all of the makeup things do you get life points for continuing to do the hobby? How many? If you don’t complete in the time limit you will not have the vanity as you have to complete in the time to unlock the vanity. sorry if this has been asked before, but can i really get the coin fountain if i don’t complete the collection in time ?? i know that in your post, you say that it’s possible, but when I click on my (still locked) coin fountain, the instructions explicitly state that i need to complete the makeup hobby within the time limit to win the fountain. Yes that is definitely correct, the time limit prize is the vanity, you get the coin fountain once you complete the hobby even if it isn’t in the time limit. thanks so much! that definitely clarifies everything! Which level unlocks dark/dawm/dusk vanities? My second sim is refusing to interact with it?like something is in his way? But nothing is in the way. Is the first sim already there or are they still walking towards it? Usually you have to wait for the first sim to get there, if you still can’t do it try sending your sim upstairs first by clicking on the floor before clicking on the makeup kiosk. Unfortunately while I was completing this after I made this post the game I was completing this on crashed and I lost all my progress, I am currently trying to find all the makeup looks now on my other game but it takes ages, I will update this post as soon as I have them all. Can one sim dothehobby by themselves? 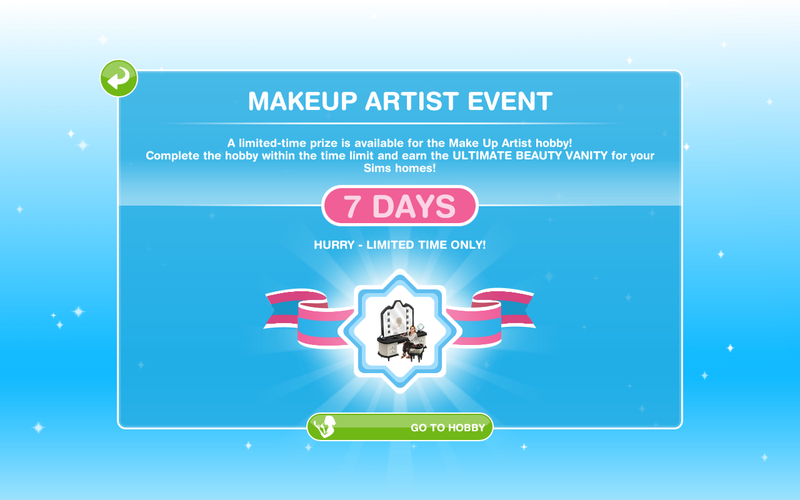 I have completed the makeup hobby once to unlock the fountain, and have reset the collection to start on the 7 looks. However I’ve tri d several times and never get a collectible! I only get a % skill increase. Is this to be expected? Do my sims need to be at a certain skill level to get any collectibles at all? I don’t remember this being an issue the first time around. When I work on this quest, first time, my two sims never ever get the earned collection item. They are on mid-level 5 right now and they still don’t actually get any collection items. Has this kind of thing ever happened to you? Thanks for the information. However, there is a glitch I am facing. My two Sims are talking to each other but at the end of 4.5 hours, I do get the percentage increase in the hobby level but I don’t get the collectible. How to correct that?? I am having the same issue and was wondering if there was any update on this yet. I have made 2 sims do this for 3 days straight and have not gotten any collectables 6 times. Strange, I don’t have this issue anymore. Have you tried two different sims? If you keep having the issue try with two different sims.